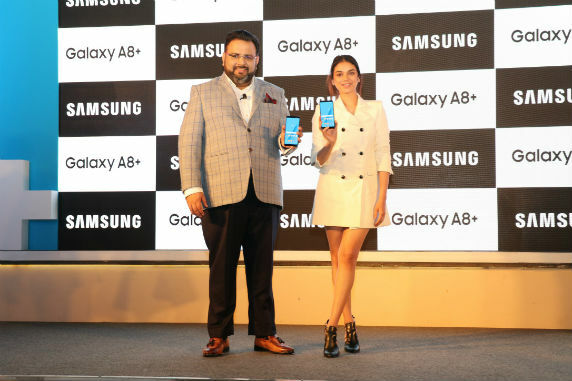 NEW DELHI, India – January 11, 2018 – Samsung India, the country’s biggest and most trusted smartphone brand, today launched Galaxy A8+, a stylish new smartphone with an attitude. Galaxy A8+ carries forward the legacy of Samsung’s A series smartphones with its stylish design and flagship features at never-seen-before prices. Galaxy A8+ is performance powerhouses with 6GB RAM, 64GB internal memory and expandable memory of up to 256 GB. It features Samsung’s first Dual Front Camera, a large Infinity Display and stunning ergonomic design that draws on Samsung’s flagship design heritage and experience. With additional everyday features, Galaxy A8+ is more stylish, practical and convenient than ever before. “At Samsung, consumer-centric innovations are at the heart of our business. With Galaxy A8+, we are bringing our customers’ favorite features from our flagship smartphones, such as the Infinity Display and our first Dual Front Camera with Live Focus, to our Galaxy A series. Galaxy A8+ comes with flagship features, never before seen on a smartphone in this price segment. It defies the ordinary and challenges the status quo. It is a phone with attitude, in all aspects,” said Aditya Babbar, General Manager, Mobile Business, Samsung India. Galaxy A8+’s large screen is supported with ergonomic curved glass on the back and front. Its sleek glass and metal frame, smooth curves and comfortable grip make it even easier to watch or interact with content on phone. When watching movies or playing games, the Galaxy A8+ sets a new standard for uninterrupted, immersive viewing experiences. The 6.0” FHD Super AMOLED Infinity Display goes beyond the bezel with an immersive 18.5:9 display ratio, so that the consumers can view the whole scene across their screen for the ultimate cinematic experience. Galaxy’s A8+’s 16MP+8MP F1.9 Dual Front Camera allows consumers to take the type of selfie they want – from close-ups with the background blurred to portrait shots with a clear and crisp background. With the advanced Live Focus feature, one can easily adjust the bokeh effect before or after take the picture to create high-quality images. The 16MP F1.7 rear camera snaps bright, clear pictures no matter where we are or what we are doing. From day to night, the advanced camera helps capture sharp images, even in low-light conditions. The new device also allows consumers to customize their photos with fun options, from adding stickers to their selfie or highlighting a culinary extravaganza with Food Mode. With the virtual assistant Bixby, the Galaxy A8+ seamlessly integrates your lifestyle.